- Numbers 13 and 96 on my life list. Standing on the middle stone of five crossing a creek, I paused to look downstream. I breathed in the view meditatively until interrupted by an unfamiliar, sort of higher pitched, Chewbacca-like moan coming from the trees. I scanned the area closely, but didn't see any movement. I stepped over the remaining stones. The noise repeated, I stopped, and searched again. My eyes connected with a young black bear's, high up a slender tree. Startled, it hurried down as quickly as a firefighter down a pole; its paws hit the ground, and vanished behind a trail of shaking leaves. Bears are generally safe if you take some necessary precautions. First of all, any bear expert worth his salt will tell you that under no circumstance should you try hugging or riding on one, regardless of how overwhelming that temptation may be. That being said, they'll also tell you to make noise so it knows you're coming, keep a clean camp, and do your best to hide the fact that you are carrying food. A black bear can detect strong smells from miles away and sniff out that energy bar in your pocket seven times better than any bloodhound, or 2,000 times better than any human. Another interesting item worth noting, a human or trained bloodhound will find it much more difficult to chew your face off while trying to steal your Snickers bar. Regardless of this superpower, and the subsequent thieving of hundreds of pic-a-nic baskets, there has never been a fatal bear attack in Shenandoah National Park. On the other hand, If it does happen, I’d put my money on it happening to a hiker who inadvertently finds himself between a mother bear and her cub. Adult bears are usually silent, but the sound in the trees came from a young cub. As they approach adolescence, they become intrigued with the idea of independence, and venture further and further from the protection of their mother. In times of danger, however, they lose confidence and realize they still need the security of an adult. Like when you’re six and a librarian ghost roars at you in the opening of the movie Ghostbusters. Don’t judge me, I was six. I worried that the Chewbacca-like moan was a distress call. Was he calling for backup? I spun around looking in all directions for an even larger mass of black fur, but didn't see mama bear. Even though I knew the danger was low, my heart raced, and I'm not ashamed to admit I moved at a faster pace for the next hundred yards. A futile attempt, since an average bear could chase down even the world's fastest human with ease. Once I knew I was in the clear, my adrenal gland eased up on the adrenaline, I soon returned to the peaceful state of mind that I was enjoying on that middle stone in the creek. I now felt thrilled that I got to see my first black bear up close in the wild. 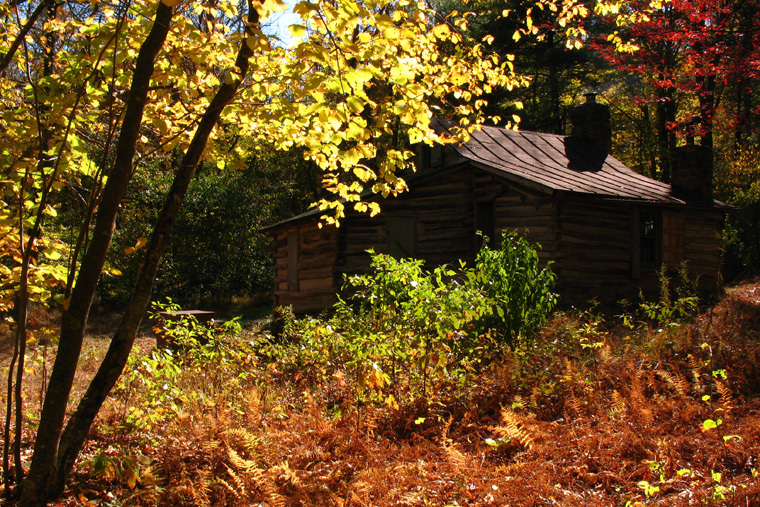 Through the trees up ahead, I spotted a mediocre, but inviting little cabin that once belonged to George Corbin. 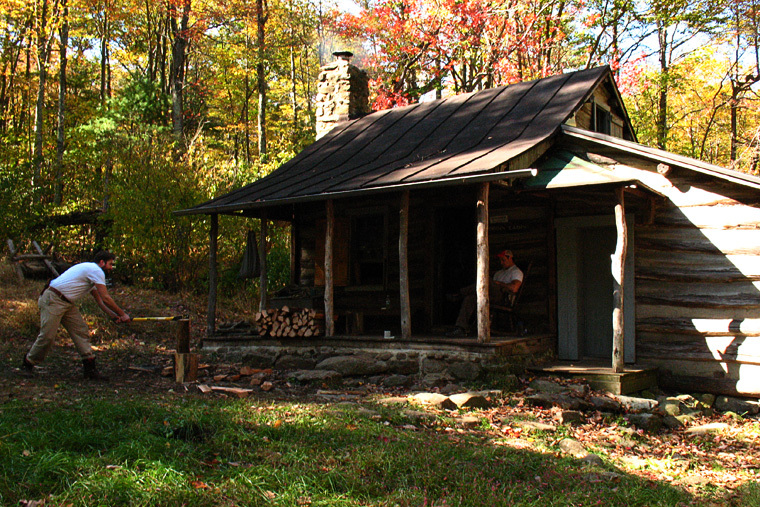 In 1909, he and his friends hewed logs from surrounding trees and constructed the dwelling. 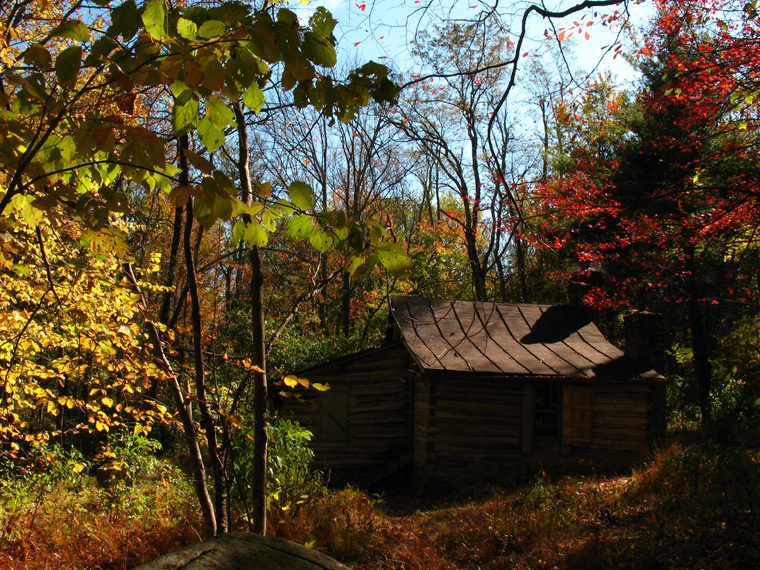 George lived here, in the smallest home on the smallest farm in Nicholson Hollow, for 29 years on what his family could grow or make themselves. George provided other necessities by supplying moonshine to the nearby resort town of Skyland. During a harsh winter, George's wife died while giving birth to their third child. Her body was laid to rest a few hundred yards from the cabin, in a family cemetery. In 1938, when the land gained national park status, George and his children were forced to pack up and leave. It is one of the few log houses still intact in the park after a fire destroyed nearly forty mountaineer homes. 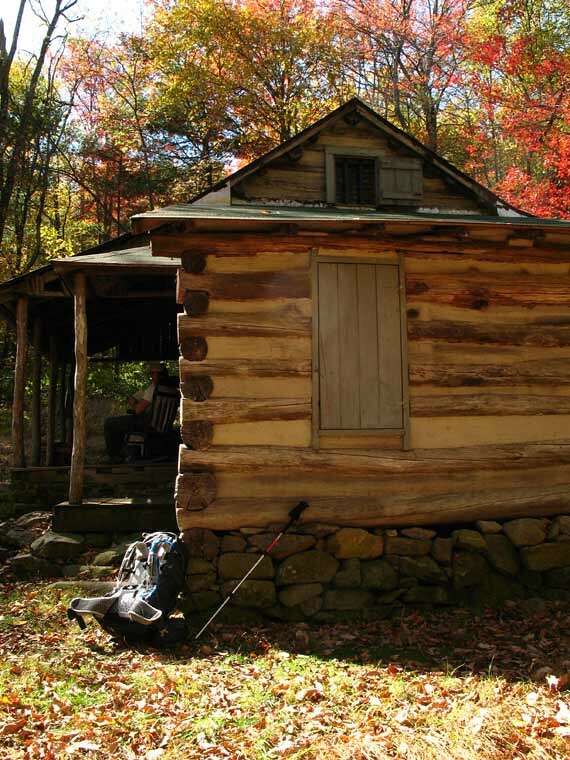 Corbin cabin is one of the last monuments of the vanished mountain community, and still provides shelter to passing backpackers. Today it served three: Jimmy, Jarrett, and Jonathan. “Hey, do you know what time it is?” one of them asked. “It’s alright, I’m ready to have that off my shoulders for a little bit,” I said, and pulled my phone out of my bag and gave them the time. I enjoy the differences in the getting-to-know-you chitchat on the trail. The questions are more interesting, and more enjoyable to answer. The ones typically heard are: where are you coming from, how long have you been on the trail, where are you from, where have you backpacked before, what is your favorite trip, why do you do this, are you insane? You rarely hear my least favorite introductory question, “What do you do?” In other words, what do you do for money? This is usually the least interesting thing about a person. It’s definitely the least interesting thing about me. I get the impression that as soon as I say, I work in IT, the person I’m talking to will immediately regret asking and go talk to someone else in the room. To which, I can defensively react with, “Yeah, but can that guy tie a clove hitch? That loser probably doesn’t even know what a clove hitch is!” Then, “Oh no he didn’t,” a passerby would invariably say. “So where are you coming from?” I pulled out my map and briefly went over the trip so far. They pointed out areas I should try to visit. They highly recommended Whiteoak Canyon, which was luckily already under yellow highlighter ink. I asked about the cabin, which they talked about adoringly. To a backpacker a modest shack like this is a fancy summer home, especially when you’ve been on the trail a few days or weeks. “Jarrett is getting married so we’re trying to get one last trip in.” They looked at each other smiling, but I detected a slight feeling of trepidation. Maybe I just assumed, since it’s how I would feel if I ever utter the words “one last trip”. “Ah we both have fiancées too, so I don’t see that happening.” Jimmy chuckled, pointing to himself and Jonathan, followed by a short awkward silence. I felt very happy to be single. “You want to take a tour of the cabin?” asked Jimmy. Jonathan went inside to check on breakfast. Jimmy and I followed. Weak floorboards creaked under my hiking shoes. 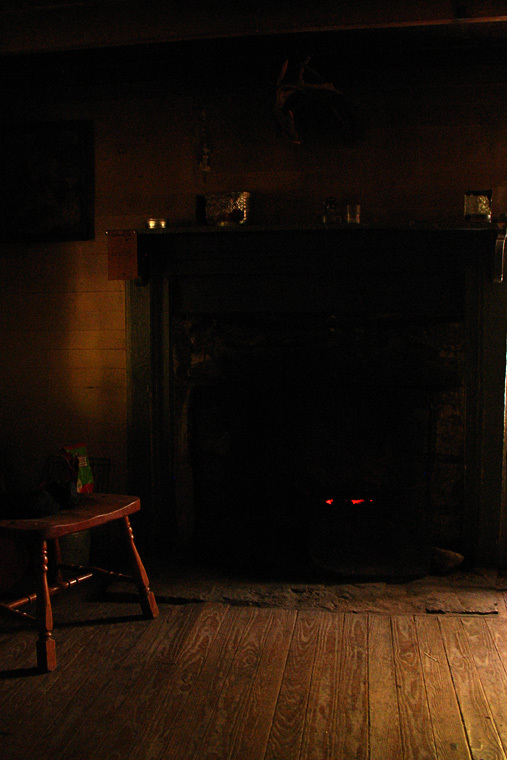 The living room was dark. 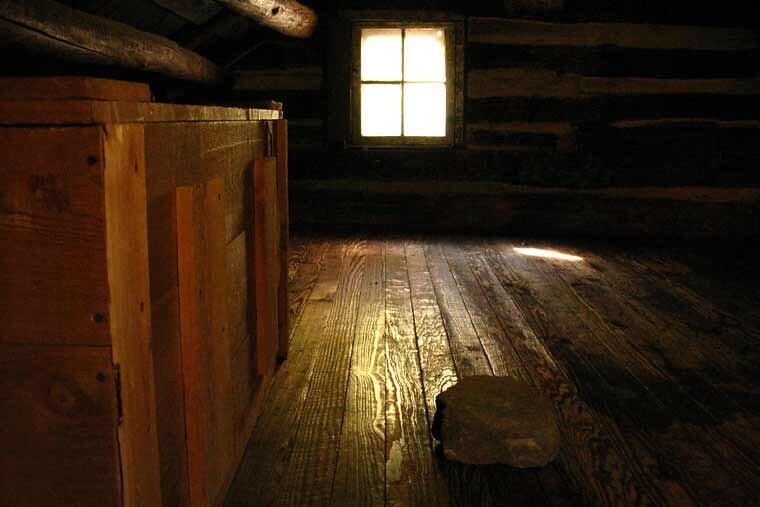 A small amount of light seeped in through an opened nearly opaque window and from a small fire crackling in the fireplace. It felt good to feel heat again. Backpacking gear suspended on hooks clung neatly to the wall below spider webs that stretched across the corners under the ceiling. A plaque with a brief history of the cabin hung beside an old sepia photo of George Corbin. He may have lost his home, but with it, gained a slice of immortality. Last night’s entertainment littered a large wooden table: a deck of cards, cigarettes, and ashtrays made from folded aluminum foil, not to mention long blade hunting knives and a couple of handguns. The weapons did little to add to the hospitable charm. Corn beef hash simmered in an iron skillet on top of an old wood-burning stove. I thought of poor Mrs. Corbin. Pots and pans hung on the walls above the stove. Left by different generations of hikers, each varied in age and wear. The smell of sizzling breakfast reminded me how much I craved a warm meal. “Ryan, you staying for breakfast?” Jonathan asked. “Oh no, I’m alright. I’ll get going here pretty soon,” I replied, even though I secretly wanted to shove him out of the way and cram it into my mouth by the fistful. Jonathan cracked more eggs into the pan and Jimmy continued our conversation. “I used to work at Sleeping Bear National Lakeshore in Michigan, you ever get up there?” This may have been the first time I had more than brief conversation with another backpacker. Sleeping Bear was home to one of my favorite nearby backpacking destinations, North Manitou Island. He also worked at an outfitter and he had plenty of backpacking knowledge. He didn’t have a career, didn't stick with one job for too long, but did something he loved. “Hey Jimmy can you finish these eggs? I’m out of commission.” Jonathan’s head was tilted back and he was pinching his nose. “I’m getting a bloody nose from this dry air; I need you to take over… Come on, I’m out of commission!” Later it seemed like they must have been doing Karate Kid lines during their trip, so I assume that is why he kept saying “out of commission”. This made me like them even more. I moved out to the porch and sat on the rocking chair. “So what do you do Ryan?” Jarrett asked, sitting down on the nearby wooden bench. The question is bound to come up eventually; at least it took some time to get there. I told him about my job, in as few words as possible, and he told me about his. Later, Jimmy brought out a large plate, nearly overflowing with a mountain of corn beef hash and two fried eggs over-easy. Nothing short of an actual mountain could have looked as magnificent at that moment. It was mouth-watering, the eggs cooked to perfection. A few minutes later, Jonathan brought me a cup of steaming black coffee in an old chipped black-and-white checkered coffee mug, a packet each of cream and sugar. I felt very thankful, and incredibly guilty. To help ease some of the guilt, I offered to chop the remaining logs for firewood. The five logs I chopped, which were the first I’ve ever chopped, didn’t really make up for their hospitality, but I know they really didn’t care. “Well, I better get back on the trail so I can get to my next site before it gets too dark.” I hadn’t planned on staying at the cabin for the two hours I was there. I thanked them for everything, but couldn’t thank them enough.